"Dread Pirate Roberts," the mastermind behind the online drug market Silk Road, seemed like a smart dude. He amassed a multimillion dollar fortune in drug money in just a few years! And he did it using the deep web and cryptocurrency usually associated with sophisticated cybercrime. But if 30-year-old self-styled "Robert Pattinson lookalike" Ross Ulbricht is found guilty of being the Dread Pirate Roberts, he will have revealed his identity in a remarkably unsophisticated way. 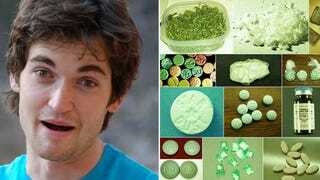 A federal agent says he pinned the Silk Road on Ulbricht with a simple Google search. In court on Thursday, special agent Gary Alford described how he googled the Silk Road's original Tor browser address and looked at the earliest results, Motherboard reported today. You can't access Tor websites through Google, but you can see when people discussed their URLs. This led him to a post in a Bitcoin forum by someone called "altoid" trying to attract people to the Silk Road back when it was starting out. Alford looked through the posts by "altoid" and saw that rossulbricht@gmail.com, Ulbricht's personal email address, turned up in his posts. He took screenshots of the damning search. If the prosecution's evidence is true, Ulbricht sucked SO BAD at keeping his identity a secret. He got tied to the site using literally the most basic Google search imaginable. And he left a veritable treasure trove of evidence, including a friggin diary of his internal turmoil regarding his burgeoning drug empire, on his computer. The Silk Road trial has covered a broad swath of internet culture, with the Tor Browser, emoticons, Bitcoin, and now Google search playing significant roles in the proceedings. And screenshots could have an important legacy in this case. Alford presented the screenshots of his Google search as evidence, which is noteworthy because screenshots are on shaky ground as legitimate evidence—something Ulbricht's defense will surely pounce on. In United States v. Vayner last year, a court ruled that screenshots couldn't be used as evidence, since it's so easy to alter images or just outright fake them. Unless Alford and the prosecution have a way to verify that they're unaltered, the defense may try to invalidate this connection in the eyes of the jury.